Baseball's first unanimous Hall of Famer and three more worthies were elected by the BBWAA. On the day of the announcement, it came forth that Red Sox writer Bill Ballou of the Worcester Telegram-Gazette changed his mind. Charity says he saw the light; certain realities suggest he felt the heat. But after calling closing the low hanging fruit of baseball achievement and refusing to submit his ballot rather than snub Mariano Rivera, Ballou weighed the tonnage of heat he took “from writers and observers whose voices are important” and submitted his ballot—with a vote for Rivera. Apparently, being great while doing a particular job under the specific perimeters of the job should still be held somewhat against the man who does it. If you care to read my original rejoinder to Ballou’s original plan of ballot non-submission and my concurrent analysis about why he was wrong about The Mariano, you can. I’m pretty sure that the last thing anyone cares about today is whether Bill Ballou saw the light, felt the heat, or fell somewhere between them. Rivera probably doesn’t. Nor should he. The only thing Ballou withholding his ballot would have done was . . . absolutely nothing, so far as an impact on Rivera becoming the first Hall of Famer ever to be elected with one hundred percent of the Baseball Writers Association of America vote on his first ballot appearance. That was the only question facing him as his election approached. Anyone else who thought he wouldn’t be a first ballot Hall of Famer at all probably spent the last quarter century in the Delta Quadrant. 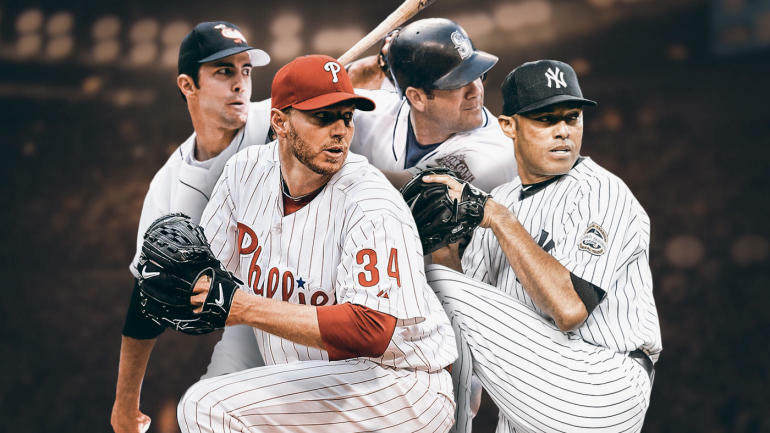 Mike Mussina wasn’t one of them. And Mussina, too, is going into the Hall of Fame, though it was his sixth try. As Rivera was renowned for his singular cutter (Hall of Famer Chipper Jones likens it to “throwing chainsaws”), Mussina was for his knuckle curve. And just as The Mariano exuded class and dignity while assassinating opposing hitters, Mussina exuded likewise while making a powerful career-value Hall of Fame case and still maintaining a little curmudgeon. Maybe the classic example was a 31 May 2006 game against the Tigers. Mussina took a shutout into the ninth inning, until Magglio Ordonez swatted a two-out single to send Placido Polanco home with an unearned run. (Polanco reached on a throwing error with one out.) Yankee manager Joe Torre looked like he was about to step out of the dugout holding a hook with Mussina’s name on it. Watch the clip. You can’t tell whether Mussina said, “Joe, stay back!” or “You stay back!” Torre stayed back. And Mussina struck Carlos Guillen out to end the 6-1 Yankee win. The next year, he was a Yankee. Cause and effect? Who would you rather have on the mound if your team makes it to the World Series? Mussina—who pitched his entire career in the rough-tough American League East—went to two World Series and while his won-lost record in those Series is only 1-1, he has a 3.00 ERA and a 1.27 walks/hits per inning pitched rate, while Pettitte pitched in eight World Series with a 5-4 won-lost record but a 4.06 ERA and a 1.40 WHIP. Mussina’s overall postseason record is 7-8 but a 3.42 ERA and a 1.10 WHIP; Pettitte is 19-11 with a 3.86 ERA and a 1.31 WHIP. I submit that you actually have a better chance to win with Mussina on the mound than with Pettitte. You don’t have to compare those two pitchers to make Mussina’s Hall of Fame case, but you might care to note that, by way of the Bill James Hall of Fame measurements, Pettitte met 44 of the Hall of Fame pitching standards and Mussina met 54, with the average Hall of Famer meeting 50. Mussina also mops the floor with Pettitte on the Black Ink (league leaderships) and Gray Ink (league top ten) Tests, Mussina showing 15 Black Ink and 250 Gray Ink to Pettitte’s 7 and 103, respectively. Mussina ranks as the number 29 starting pitcher of all time; Pettitte ranks 90th. Edgar Martinez, who made it to the Hall of Fame at last and on his final BBWAA ballot try, says this about Rivera: “It was always a challenge to face him, but I enjoyed the competition and I think he did, too.” That’s putting it politely. As Rivera himself once put it, “It didn’t matter what I threw him. I couldn’t get him out. My God, he had my breakfast, lunch, and dinner.” The only thing he left out was dessert: Martinez’s lifetime slash line against The Mariano is .579/.652/1.053. The last is only Martinez’s slugging percentage against him; the OPS would be 1.705. Think about that: The likely second greatest hitter who ever played the bulk of his career as a designated hitter (if you’re not giving Frank Thomas the number one spot, you need help) had a 1.705 OPS against the no-questions-asked greatest pitcher ever to work as a major league closer. It makes you sad that Martinez’s teams weren’t as good as Rivera’s teams long range; the thought of seeing them tangle in more than just a couple of postseason games is just too delicious to bypass. It probably makes Mariners fans sadder that they couldn’t send a lineup of Edgar Martinezes up against a pitching staff of Mariano Riveras. And it makes you look forward to the pair of them needling each other affectionately on the Hall of Fame stage. The best starting pitcher of the 21st Century so far (well, among those not named Clayton Kershaw, anyway)—who also made the Hall of Fame on his first try this time around, and who’s the only pitcher in the game’s history to pitch a perfect game in the same season during which he’d pitch a postseason no-hitter—Doc Halladay would probably love playing maitre d for whether Rivera or Martinez shake hands before or after Gar hands The Mariano three plates—one with breakfast, one with lunch (a Ballouney on wry, perhaps? ), and one with dinner. Boycott Cooperstown until they let in Curt Schilling. Page created in 0.926 seconds with 21 queries.